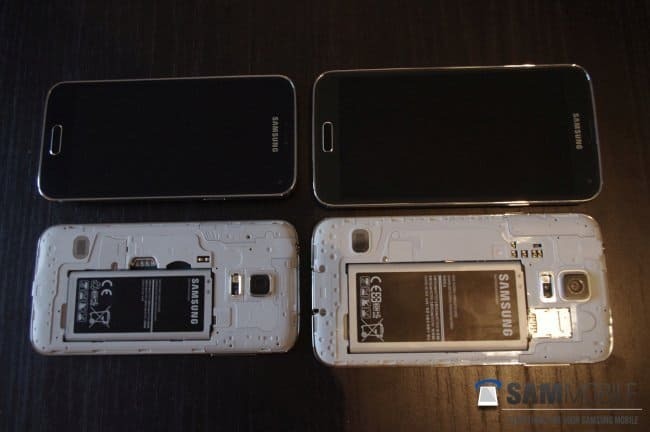 Some new images and specifications of the new upcoming handset Galaxy S5 Mini from Samsung has been leaked which is a mini variant of its flagship device, the Galaxy S5. 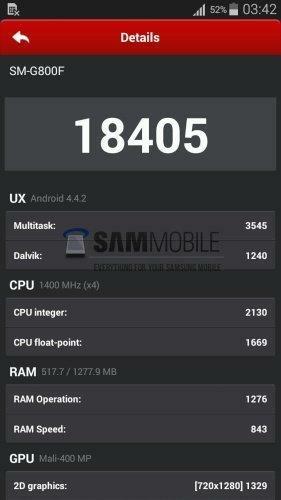 The specifications were leaked by Sammobile and the screenshot shows Antutu benchmark and CPU-Z, along with new pictures of the smartphone with the Galaxy S5 for size comparison. If you compare the images with the S5, both look pretty similar and S5 mini is just like the S5 with a soft touch back panel, heart rate monitor and fingerprint scanner. According to sources, the S5 mini is going to have dust- and water-resistant body. The Galaxy S5 Mini will feature a 4.5-inch 720p Super AMOLED screen, fingerprint scanner, heart rate sensor just like the S5 and connectivity options like LTE, Wi-Fi 802.11n, Bluetooth 4.0 LE, IR Blaster, NFC, GPS with A-GPS support and GLONASS and MicroUSB port, just like the S5, but smaller in package. The S5 Mini may be powered with Samsung Exynos 3 clocked at 1.4GHz and Quad-Core Mali-400 MP4 GPU at 450MHz for gaming. The device will be powered by 1.5GB of RAM which will be enough for handling tasks and the leaks indicate 16GB of expandable storage, 8-megapixel primary camera and a 2.1-megapixel front camera. Galaxy S5 was launched this year at the MWC, Barcelona and succeeded to achieve a whooping 11 million sales in the first month of its launch, beating the Galaxy S4’s first month sales by nearly a million handsets and setting a new record. 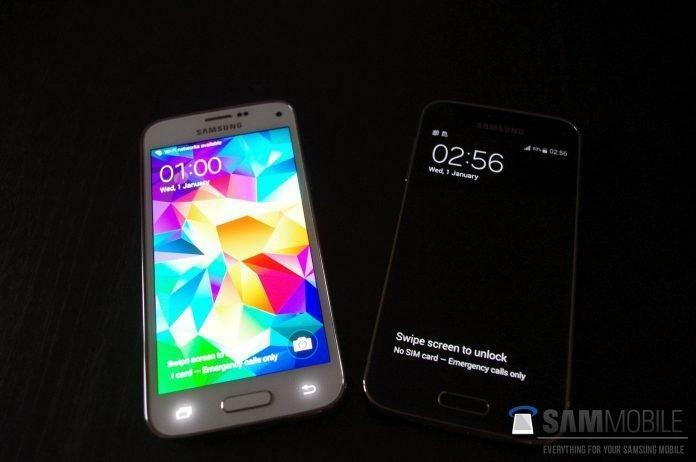 Rumors suggest that Samsung may launch this tinier package of S5 in the upcoming Galaxy Premier 2014 Event. Samsung is also planning to launch new variants of the Galaxy S5 very soon- Galaxy S5 Prime and a Galaxy S5 Active.